The Clarets are now without a win in seven games in the Premier League after Spurs closed the gap on leaders Chelsea with a 2-0 win at Turf Moor. And the pressure is suddenly on Sean Dyche's side, who have looked comfortable throughout the majority of their term in the top flight. Hull City's win over West Ham at the KCOM Stadium, in which the hosts overcame a deficit to claim the spoils, now means that Burnley only hold a five-point advantage over the Tigers with eight games remaining. Suddenly the table doesn't look to pretty, with Crystal Palace and Swansea City the only buffers from the drop zone, adding even more importance to the midweek fixture at home to Stoke City. For a moment it was looking as though the away side's lack of composure in front of goal would prove costly but Eric Dier's calming influence spared the blushes of Dele Alli and Moussa Sissoko. Alli stayed grounded after his profligate episode, burying his head in the turf, as he tried to come to terms with his 'miss of the season' contender. The opportunity was built from Christian Eriksen's artistry with the Danish international gliding past Ben Mee and forcing a save from Tom Heaton. The ball dropped for the England international on the six yard box where, under pressure from Michael Keane and Stephen Ward, he somehow side-footed over the bar and in to the stands. It was a half where opportunities were few and far between but the incidents within it would spark a turn of events. Victor Wanyama hobbled off, shortly followed by Harry Winks, who sustained a serious-looking injury in what appeared to be an innocuous moment, and the visitors suddenly found a rhythm with the introduction of stellar substitutes Mousa Dembele and Sissoko. The latter was guilty of spurning a superb opportunity early in the second half when slicing wide from close range but, all in all, the French international added to Spurs' flair and finesse. 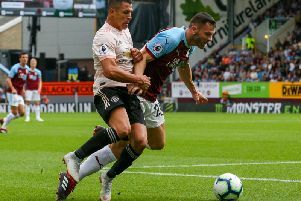 Heaton made another vital stop when beating away Ben Davies's strike after the Welshman traded passes with Vincent Janssen, who was also denied by the Clarets skipper moments prior. Eventually, though, with 66 minutes on the clock, the away side made their dominance count. Jeff Hendrick failed to clear Eriksen's corner with any conviction and Dier brought the ball down and fired home. At the opposite end, as the hosts sought a response, Keane, on his return from international duty, swivelled inside the area but failed to hit the target with his left foot. Mauricio Pochettino, without leading marksman Harry Kane, still had the luxury of having Heung-Min Son on his bench and it didn't take long for the South Korean to have an impact after replacing Janssen. Within minutes he fired in to the side-netting after Hendrick's mis-placed pass put Eriksen on the offensive and then, in the 77th minute, he scored. The Clarets lost the ball in the middle of the park, Eriksen ignited the attack, Alli squared when collecting possession inside the penalty area, and Son tapped in to the net unchallenged to double the lead. Spurs could have had more before Stuart Attwell sounded his final whistle too. Alli's measured finish floated wide of the upright with Heaton at full stretch before the same man pulled an effort wide of the far post having delayed his shot from Son's pass.